Yoga Stretches for a Long, Lean, Flexible Body! Yoga Stretches and Stretching Exercises Can Make You Look and Feel Younger! Yoga stretches and stretching exercises feel wonderful and provide much needed release to tight muscles and joints. By now we all know that the body needs a certain amount of flexibility to feel good and to function properly, so adding yoga stretches to your daily routine is an important part of keeping our bodies in a youthful, healthy state. Poor flexibility can be a deterrent to any activity in addition to increasing the occurrence of injury. Including yoga and stretching exercises allows the body to relax and elongate and decreases stress. Tight muscles lack the fluidity needed to perform the most simple tasks. Tight muscles can be painful and limit our range of motion. This tightness in the body gets more pronounced with age. Our bodies also suffer from increased tightness and inflexibility when we workout with heavy weights and don't fully and properly stretch the body afterward. Tight Hamstring muscles, the major muscles in the back of the legs, can cause lower back pain and a variety of back problems. The ability to stretch, i.e., flexibility, is joint specific, meaning that a person can be flexible in one joint and lack flexibility in another. Yoga exposes inconsistencies in range of motion in different parts of the body and from one limb to the other. Flexibility is increased by yoga and it is best to practice daily, but significant benefits can be achieved with just three sessions a week. Stretching helps prepare your body for any activity and decreases your chance of injury. An important aspect of yoga is stretching the body's soft tissues (tendons, ligaments and muscles), and to hold the stretched position for as long as possible or comfortable. Contracting a muscle before and during a stretch adds to increasing the flexibility of the muscle. Stretching while keeping some tension in the muscle has been proven to allow even greater flexibility. This is why yoga promotes superior body conditioning and flexibility. Yoga is not just stretching, but a combination of strengthening and lengthening (asana), in addition to the many other important parts that make up the entire yoga spectrum (eight limbs), such as breathing (pranayama), and meditation (dhyana). 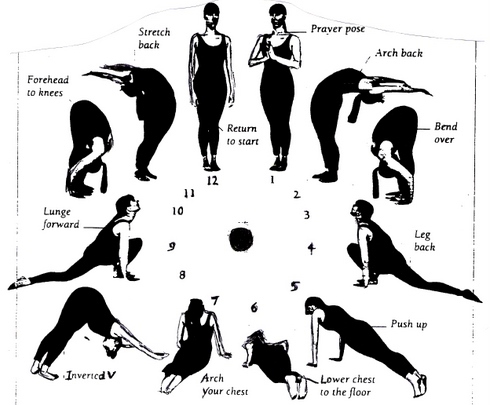 Warm-ups are very important before going into any deep yoga stretches or stretching exercises. Surya Namaskara (also known as the Sun Salutation) warms the body and is usually performed at the beginning of a yoga session as a prelude to the ensuing asanas. There are a total of twelve positions. One position flows into the next to make a continuous flow of movements. Doing several rounds of Surya Namaskara will warm the body, increase flexibility, and prepare the body for more intense yoga positions. You can also perform several rounds of Surya Namaskara as a complete routine for an easy, gentle way to increase the circulation, release stress, strengthen and stretch the body. The diagram below shows the twelve positions of Surya Namaskara. Click here for my Sun Salutations demo on You Tube. Warm-ups should be done with precision and care to maximize effectiveness; stretching cold muscles can directly contribute to pulled and torn muscles. A heated room is very effective and necessary to warm the body during yoga, especially yoga that may be of a more advanced level. The room should be a minimum of 72 degrees. We do have to ask the question as to how much flexibility is truly beneficial. Is there such a thing as too much flexibility? Extreme flexibility and hyper-extension can cause instability and severe problems in the joints. Real benefit comes from being flexible and having muscular strength. When the two are combined, the perfect combination exists. As a result of practicing yoga over many years, the body naturally opens up to levels of flexibility that are impossible for most people new to yoga to achieve. Therefore, someone just starting out in a yoga practice should never stretch beyond their capacity. With practice and care, the body will achieve a healthy combined level of strength, flexibility and balance. It is important to note that not all bodies will or should stretch to the same capacities. Every body is unique and we need to honor our uniqueness. Yoga stretches and stretching exercises are important for every activity, especially for sports, but many people neglect this aspect in their training. Stretching is an integral part of any exercise program, and that is why yoga and yoga stretches are so important. It compliments other workout routines by adding the components of flexibility, strengthening, balance, concentration and a release of accumulated stress. Try adding beginner's yoga and stretching exercises to your workout routine and feel the amazing benefits!